This diagram shows how NCCs migrate differently in rats, birds and amphibians. The arrows represent both chronology of NCCs migration and the differential paths that NCCs follow in different classes of animals. The solid black portion of each illustration represents the neural crest, and the large black dots in (c) and in (f) represent the neural crest cells. The speckled sections that at first form a basin in (a) and then close to form a tube in (f) represent the neural ectoderm. The solid white portions represent the epidermal ectoderm. During the neurula stage of all vertebrate embryos (a), the neural crest is located in two places on the neural plate. 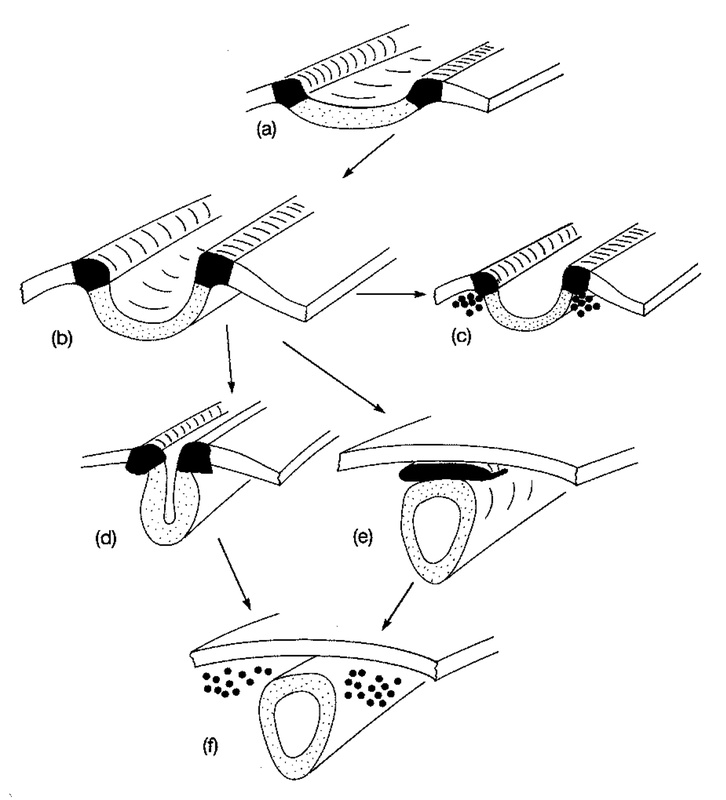 As the neural tube forms (b), a process called neurulation, the neural crest moves with the folding plate as it forms the junction between the neural and epidermal ectoderm. NCCs migrate differently in different classes of vertebrates (c-f). For instance, in rats (c), the NCCs migrate away from the neural crest before neurulation completes and while the neural fold is still open. In birds (d and f), neural crest cells do not migrate until the neural fold closes. In amphibians (e and f), the neural crest cells migrate after neurulation completes, and only after the cells have accumulated above the neural tube. Subsequently, NCCs will all migrate down their specialized pathways and diversify into the several sub-types of NCCs.